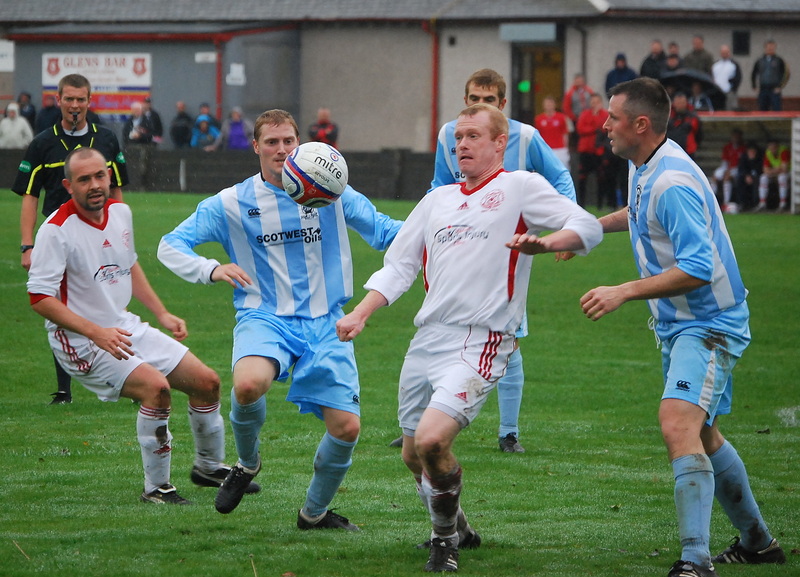 Glenafton unravelled a string of three home league draws in a row with a scintillating second half display that had Girvan tied in knots. The Seasiders were left beached as the home side netted three goals in a ten minute spell and left Loch Park with only a late consolation. Overcast conditions at kick-off with rain threatening did little to dampen the aspirations of both sides to play open and attacking football which in turn yielded several chances at both ends. Ian Cashmore revelled in facing his former side and almost set up the opener for the Glens in four minutes when his cross from the left to the back post was partially cleared by Alan Love. In raced Craig Potter to smash the ball on the drop from 8 yards out only for Darren Johnson to stretch and pull off a stunning save and then to partner Nicky Faulds in preventing Potter heading home the rebound. 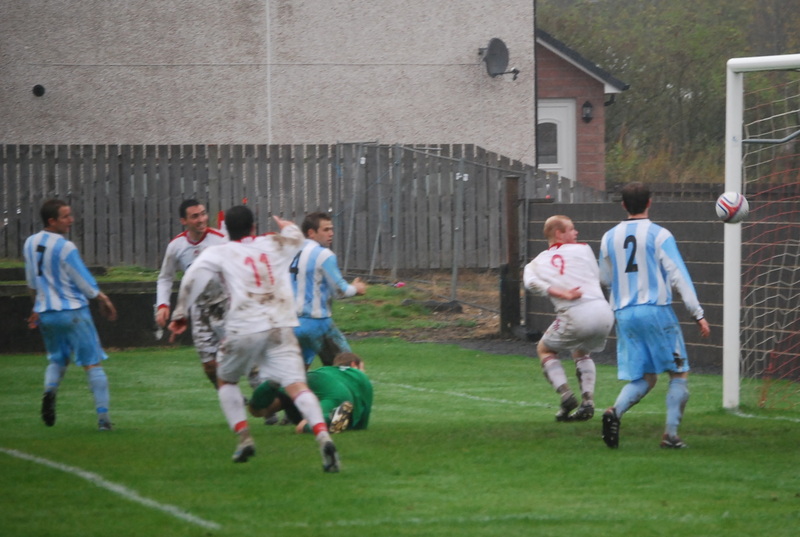 Three minutes later the visitors moved the ball from box to box with a slick passing move that saw the impressive Neil Gilmour pick out Sean McKenna who then rolled the ball into the path of Lee McCrae and the midfielder’s fierce shot from the corner of the penalty box whizzed over Ally Semple’s bar. At the other end the Glens forced a series of corners the best of which saw Cashmore dive low at the edge of the six yard box but his flashing header was blocked at the near post by former Glenafton player Scott McQuade. Good runs by Cashmore and then McKenzie ended disappointingly for the home side with Johnson not being tested. The same could be said for visitors McKenna and McCrae their finishing not matching their eye-catching build up play. On the half hour mark with the drizzle now coating the playing surface tempers began to get the better of both sides. Cashmore was the victim of a couple of crunching tackles which although earned the home side free-kicks, the perpetrators went unpunished. Five minutes later Glens captain Robbie Henderson the purveyor of an equally robust tackle was shown yellow and the official’s apparent lack of consistency not appreciated by the vocal home support. Light drizzle had now become heavy horizontal drizzle and with it thoughts that the game could reach the same dizzy heights of the opening twenty minutes or so were in danger of being washed away. Thankfully, Paul McKenzie had other ideas and the magical midfielder took the game by the scruff of the neck. Skipping past McQuade on the half-way line he exploded down the left flank, played an exquisite one-two with Cashmore on his way to the dead ball line, cut back and fired the ball across the goal mouth only for it to be scrambled cleared by Scott McGilp, the ball eventually falling to Lewis Sloan but his effort sailed high over the bar. 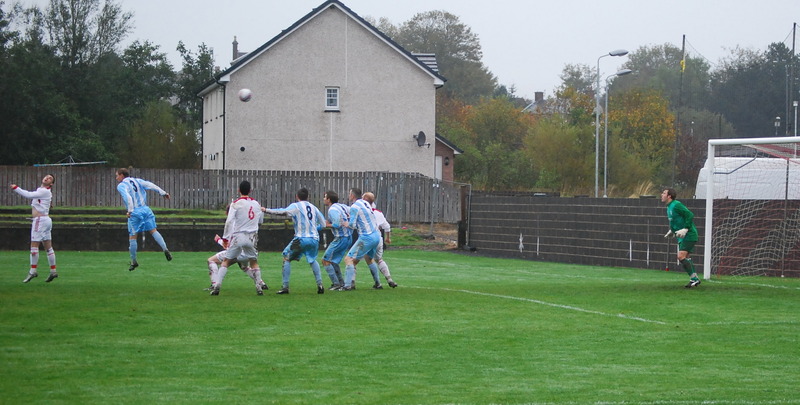 At the other end Menzies was injured as the Glens eventually scrambled cleared a Girvan attack and minutes later his replacement Ryan McChesney beat Stuart Peacock in the air but his header looped inches over the bar much to the relief of Johnston at full stretch. On 58 minutes McKenzie picked up a Gareth Armstrong header at the edge of the box but with his way to goal blocked wheeled around to feed Craig McEwan who launched the ball to the back post where Paul Murphy and Gareth Armstrong were lurking with intent. 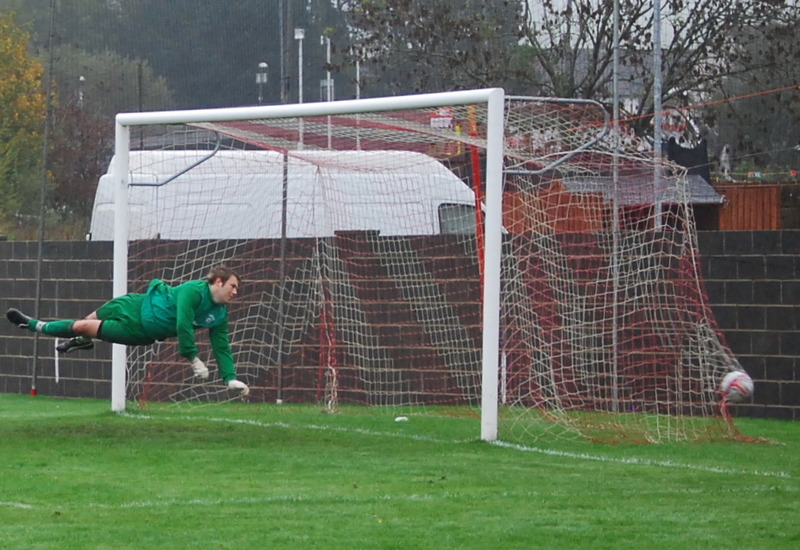 The former won the header and the latter beat keeper Darren Johnston in the race to retrieve the loose ball and hook it back into the net from the six yard line. Two minutes later another ball to the back post, Cashmore the provider, allowed Armstrong to return the favour and beat Johnston to the ball and Paul Murphy to head it home from four yards. The home side’s tails were up and McKenzie was running the visitors ragged and as he skipped passed one after another he played a deft one-two with Armstrong as he entered the box and pulled back the right foot to let fly only to be bundled to the deck. No penalty and as play raged on the ball was recovered by the Glens and a Murphy header, ironically from the penalty post, zipped past the post with Johnston rooted to his goal line. On 67 minutes Sloan was brought down by McGilp some 30 yards or so from goal. Too far for a shot a goal the free kick was played into the box where substitute Gareth Campbell with his back to goal rose to beat McQuade and send the ball skywards and looping over Johnston at full stretch. Gutted Girvan to their credit kept their cool and on 73 minutes a number of their arms were raised aloft in appeal as the Glens scrambled clear a free kick in a packed area, but again the official witnessed nothing to warrant a penalty. Similarly, ten minutes later in the other box, Potter’s claim for a spot kick after a Kyle Faulds challenge were waved away. The visitors’ consolation came with two minutes to go as Alan Love weaved his way through a busy penalty box and played a clever one-two with Stuart Wilson before guiding the ball home from close range. With Ardrossan Winton Rovers on Scottish Junior Cup duty the well deserved victory takes unbeaten Glenafton to top of the league. This entry was posted in GAFC Match Report and tagged Girvan. Bookmark the permalink.